Dan has been talking about starters and activity so thought i would have a look at how mine performed. My starter is a relatively firm one, and I usually refresh it based on the original post by Zolablue. This was the first starter that worked for me 4 years ago after several failed attempts. 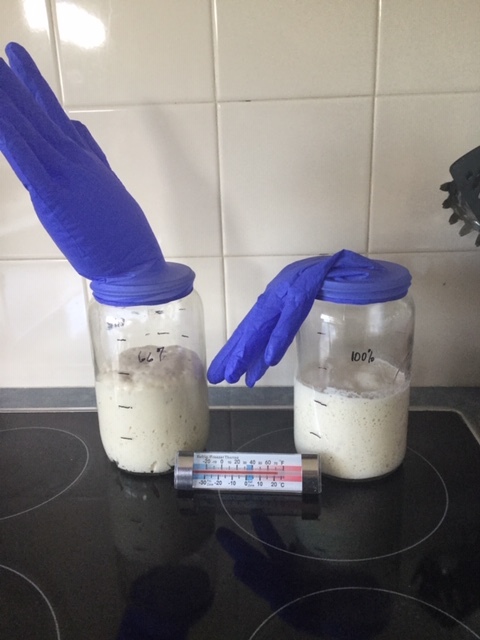 I mix 10 g starter + 20 g water + 30 g flour. Later in the day I repeated this mix and left it overnight. 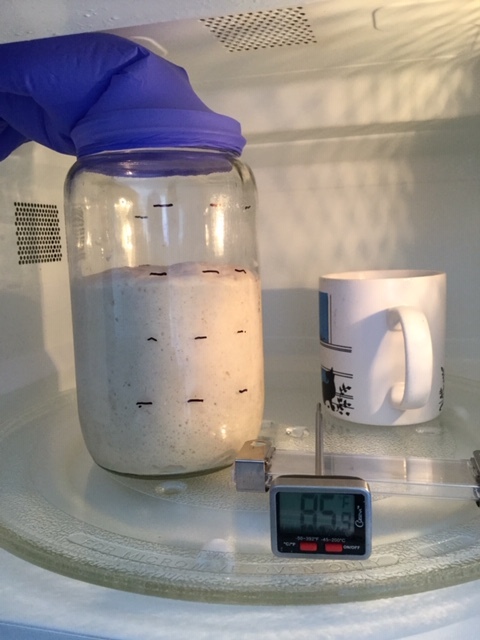 In the morning I mixed up a new batch of 240 g starter and placed in a 1 litre glass preserving jar. 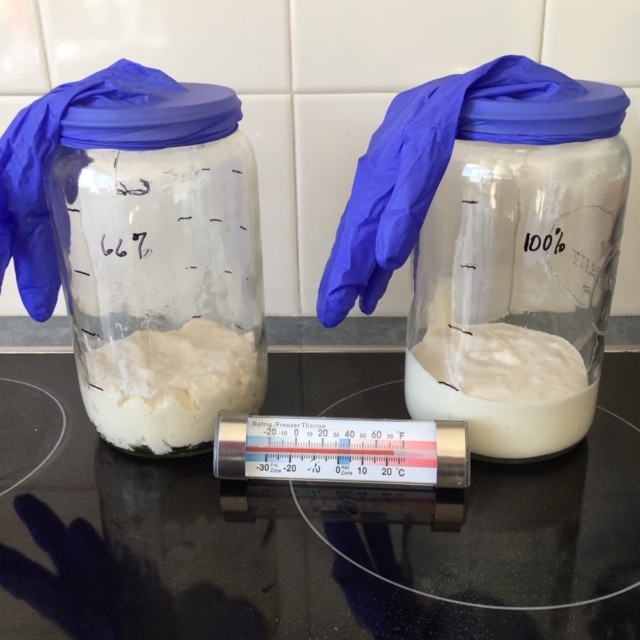 I marked the sides every 200 ml as the starter was approx. 200 ml in volume. 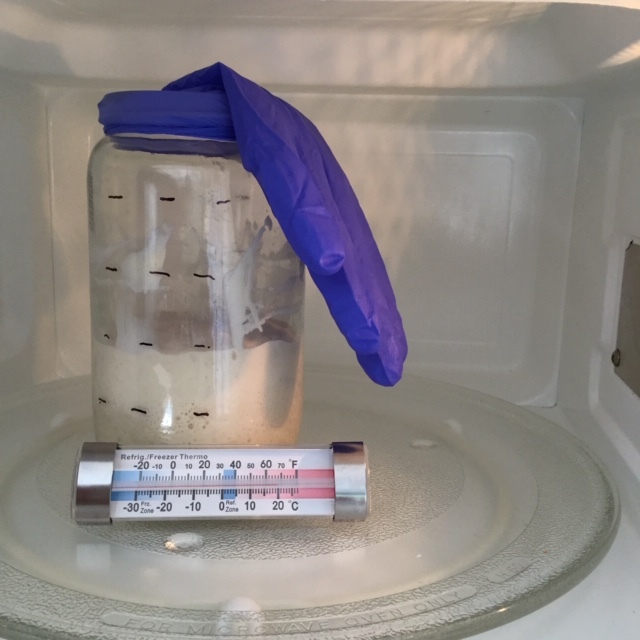 I wanted to see just how active my starter is at around 80 deg F. I topped the jar off with a glove to see what gas production there was. I preheated a cup of water in my microwave, thought I had it pretty much at 80 deg F but it was actually more like 82 – 85 deg F all day. The door was propped open and temperature remains quite stable. 15:15 pm - this was the peak, glove full of gas. 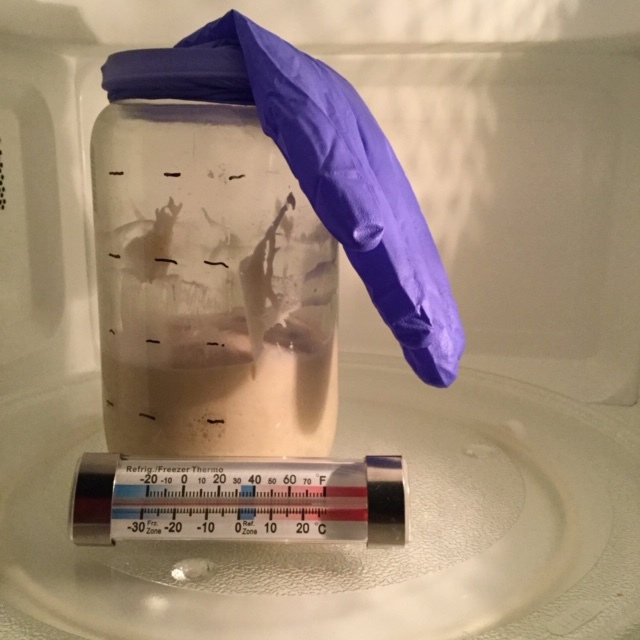 20:20 pm – 12 hours after mix and well past peak. 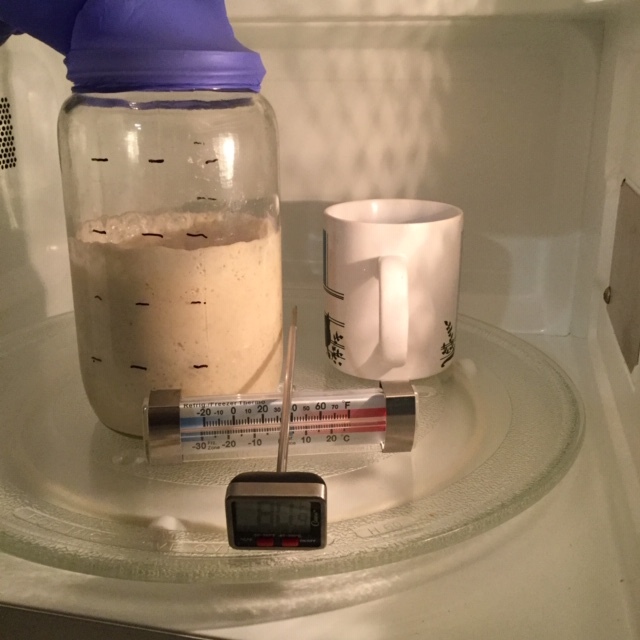 At this point I stirred the starter down, level was just a bit above 200 ml mark, shut microwave and left overnight to see what would happen. 8:20 am next morning – it has doubled again but not a lot of gas in comparison to first peak. 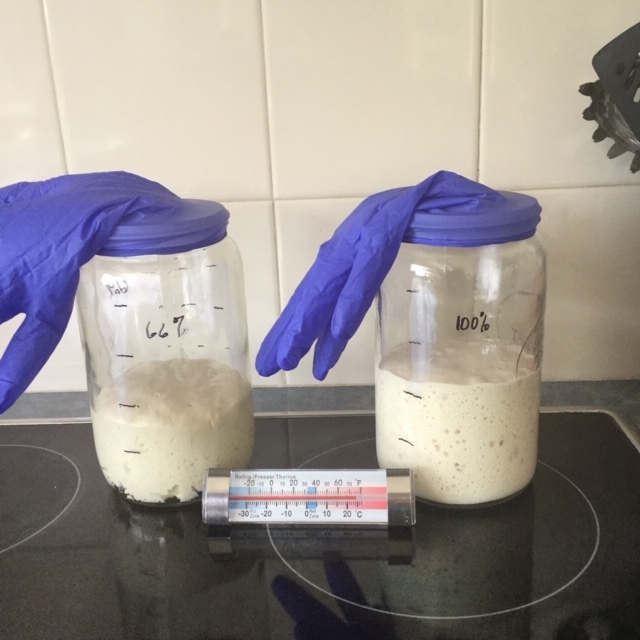 Okay, now what happens when I have my firm starter at 66% hydration and compare it to a starter at 100% hydration? Mixed up a batch of 100% hydration also using this as seed. 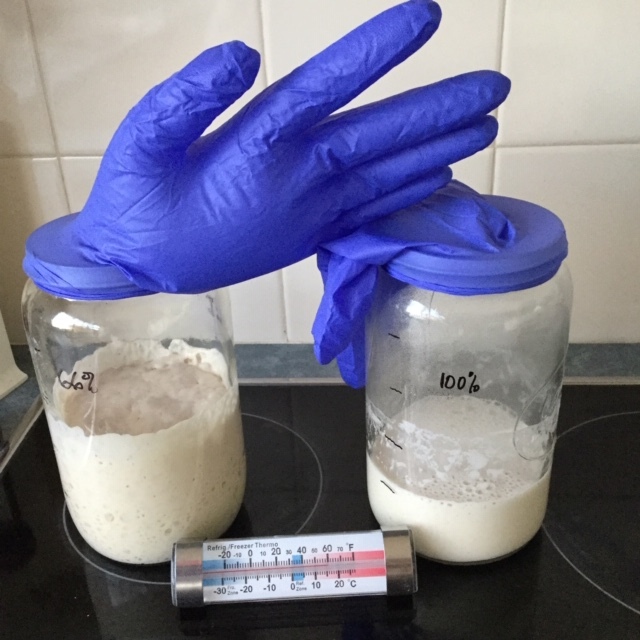 Marked another jar in 200 ml steps and placed 230 g starter in each labelled jar, topped off with disposable glove. Jars were left at room temperature and photographed as I could. 16:15 pm 66% has really out produced 100% in gas production and volume is also greater. 100% has just past the peak and is receding, less gas production. 07:10 am here they are this morning, at the end of the 24 hours. 100% has returned to starting volume although 66% had strength to stay a bit longer. Fascinating the way the 2 different hydration starter performed. comparing them side by side has been enlightening. The first part at 80 - 85 deg F the starter tripled - so I am happy with that but I don't know if more activity is achievable. How would this impact on crumb? would an even more vigorous starter (if it say quadrupled) give a more open crumb? It is often mentioned that firm starters are stronger, so it was interesting to actually see that happening. 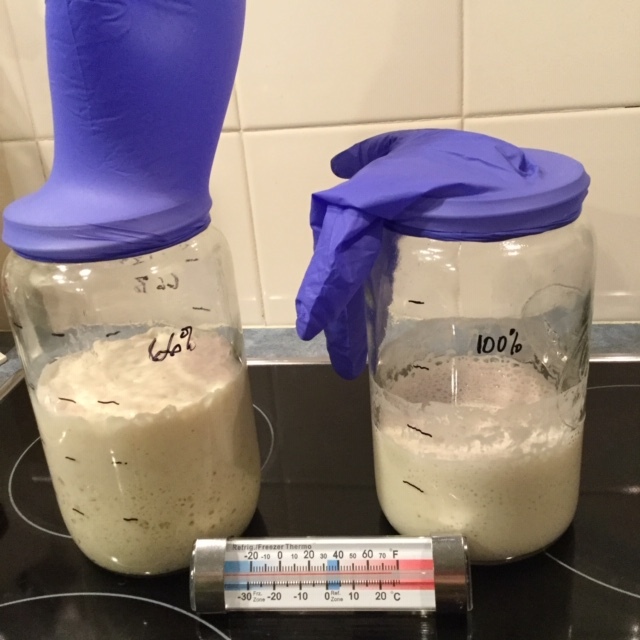 the 100% hydration starter did not appear to have produced as much gas either - is this because there is less flour (food) in the same weight of starter? A few things to ponder. It is fascinating to see how the two starters behave. I also love the blue gloves waving at each other! 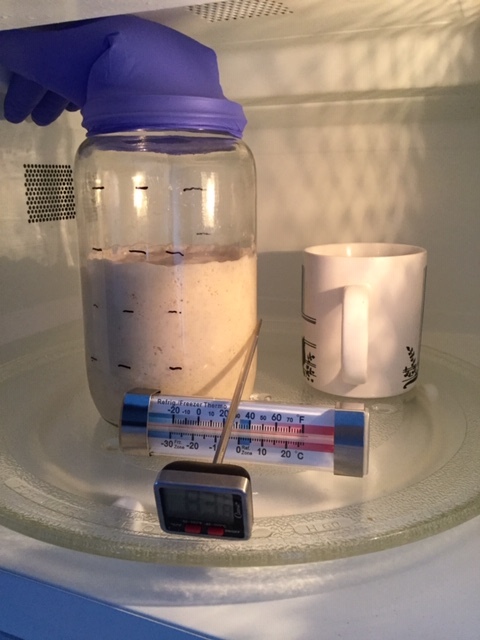 Do you think, then, that if you have a recipe that called for, say, 150g of 100% hydration levain, that you'd get a stronger levain if you built it using a 65% starter rather than a 100% one? Between this experiment and Danny's various proofing ones, there is a gold mine of learning here. I read a post here I think, about that. 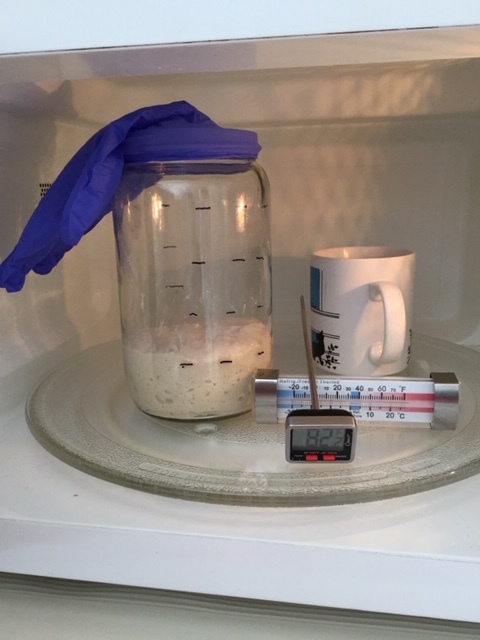 If I remember correctly, you don’t lose the strength when you add the remaining water to a stiff levain when adding to final dough, but whether that translates into more dough strength from a starter maintained stiff or as 100% starter I don’t know. 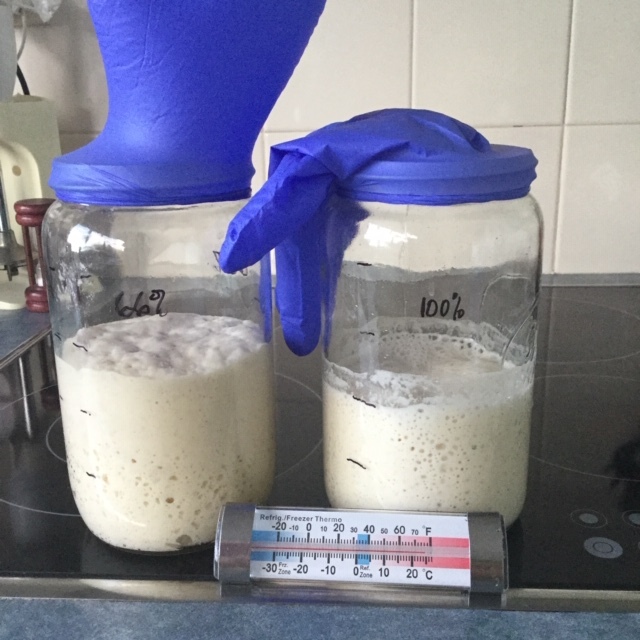 comparing the two was really an after thought, and I was surprised at how quickly the 100% levain worked compared to the stiff one, and then how quickly it peaked and collapsed. for me, the seeming lack of gas production was surprising. hopefully one of our gurus will give us some insights. after using a stiff starter for a while and not seeing so much different you make me wonder again now!!!! unless formula calls for something else. it is just easier to incorporate a 100% levain into a dough than a 66% one. 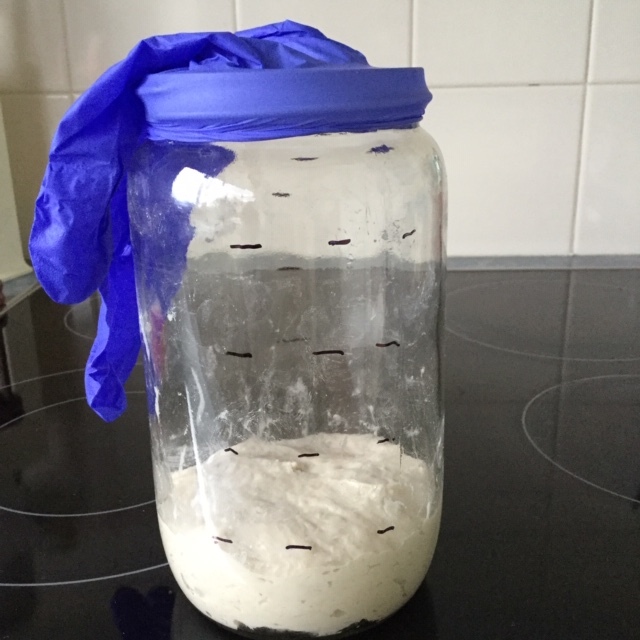 As I usually only bake every 7-10 days, my starter sleeps in the fridge so I bring it out and build the required levain and refresh the mother about monthly. I don’t normally have much discard. I have a heap now so will need to do something with it..
of Lactobacilli to yeast. would that have changed in the second part given my room temperatures were lower, albeit still warm? was the fast rise in the 100% version mostly due to LB or yeast?